Don't forget to leave a comment on the previous post for the blog candy drawing to be held on Friday. I promised you all pictures of the dinner and a murder party we hosted with our best friends...so here we go with just a few. I may have to use two posts as blogger has limitations on how many pics can be used and I need to get to bed so will add more tomorrow. Thanks go to my DH for his photography. The first couple of photos are of the front entry. We flipped an old banner over to write our greeting..you can see our school "mascot" on the sides. Our real high school mascot was a panther and since our colors were pink and black, our mascot was, of course, the pink panther! We had the silver tinsel hanging over the door to signal they were to assume their characters upon entering. Isn't this just the most creative idea? 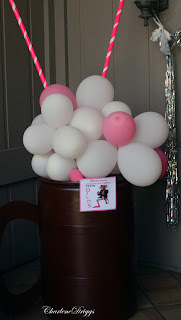 My BGF, Patty and her DH saw this cute root beer mug filled with balloons as foam on the internet for nearly $200. Way over our budget but way cute. They had this old soy sauce barrel at their house...I know, you all just have these lying around, right? Someone gave it to them and Patty's DH always has a use for nearly everything. They painted the barrel brown (it was blue), made a handle out of heavy cardboard, then we added the balloon foam and "straws" made from pvc pipe (yes, he had that too!) wrapped in hot pink duct tape. 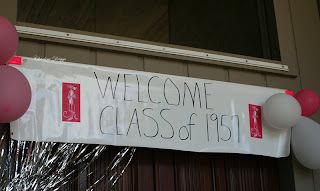 Our sign says, "Welcome Class of '57, Think Pink". The pink panther just happened to be wearing shades and a black leather jacket....perfect! The next photo was the MOST fun! The tables! We used inexpensive paper placemats and stamped musical notes on them, wrote "Go Pink Panthers" in one corner and "Class of "57". Old 78 records were our plate chargers, 50's sunglasses were our napkin holders. 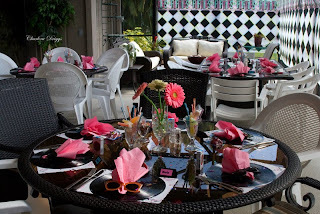 Our centerpieces were old fashioned sundae glasses filled with 50's candy...pixie sticks, marshmallow cones, and wax bottles filled with that sweet liquid in different colors...we had candy cigarettes by the guys places and wax lips by the ladies. We used a computer font to generate the place cards, printed on SU pixie pink and mounted on black. Patty found those GORGEOUS gerbera daisies at a nursery in town. We put them in some footed glasses I had and used straws to support their stems. The screen room was "wrapped" in a 50 ft. "scene setter" and banner to set the mood. We had "I love Lucy" dvd's playing on the TV with no sound and 50's music playing in the background. Since I can't get all the photos here and the rest are people shots, I'll finish up tomorrow. I'll have a card for you too. Wow, all these decorations are wonderful! You put a lot of work into this, and it looks like you guys had a blast!